Serena Matthews – At home in Nashville. Does an artist have to play ‘live’? 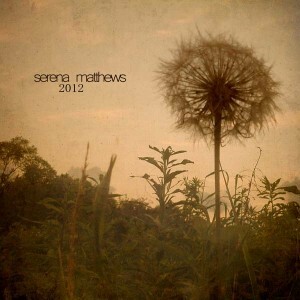 I first heard Serena Matthews when she was signed to an Indie label from New York. I thought her voice and songs were amazing, so clicked the site to see where she was playing. She wasn’t. No gigs at all. Nothing. Was I disappointed? Not really. I was happy to buy her album, ‘Staircase’ and listen to her extraordinary voice at home and on my iPod. I bought the album after hearing ‘Moon Hanging Low’, which is still in my top-ten, all-time favourite songs. I was captivated by her beautiful, ghostly voice and the often strange subject matter of her songs. She falls loosely into a ‘Country-Folk’ genre, but that doesn’t do it justice. I don’t agree. I think she writes about this world but she sees it differently from the rest of us. She writes from the point of view of ravens being shot at, sings about dead people in cars and narrates Emily Dickinson’s dreams. I was intrigued on many levels. Why would she not play ‘live’? Serena clearly had some great songs, a lovely (and sellable) voice and was pretty too. It made no sense to me. She even had stars like Jewel talking about her. A few months later, I was in Nashville, doing some gigs of my own and I contacted her. Being a gracious Southern woman, she invited me to her home (in the appropriately named Birdsong Avenue) for a chat, a coffee and chocolate cake. It was the middle of a heat-wave but her lovely home was cool as a river. “Music as a child… oh, my. The classics. Country and rock radio because that’s what my parents listened to. Dolly Parton, Willie Nelson, George Jones, Bruce Springsteen, Lynyrd Skynyrd, The Allman Brothers. My grandparents listened to a local bluegrass station which sat across the border in Kentucky. (We lived right on the line pretty much.) So it was a lot of bluegrass as well, and country. I listened to more country music growing up than anything else. My favorites were Willie Nelson and Alabama probably. Hard to pick favorites. Randy Travis is amazing. We listened to his tapes so much. Can you talk about the process of actually writing your songs? 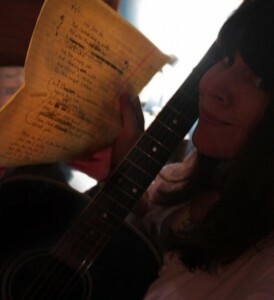 The lyrics come first often… but most of the things I actually record happen simultaneously. Just pick up the guitar, start playing and the words come out. In fact I have a song “Midnight Song” which I wrote and recorded at the same time. I just started singing it with the recorder on.. so I never even had lyrics on paper. It’s a one take song. The same is true of “Forgotten” and “Mama Don’t Worry”. Just stream of consciousness. I sometimes feel like writing ‘The Responsible User’s Guide to the music of Serena Matthews” because so much of it doesn’t make sense without knowing the stories behind the songs, or realizing that some songs are not about me, they’re just stories and nothing more. ‘Thursday Dawn’ is inspired by a preacher’s wife murdering her husband because he apparently was an unbearable jerk to her for entirely too long and she went literally insane and shot him as he was sleeping. I forgot if I told you that before. Mary Winkler was her name. Here in Tennessee, a big huge story back 5 or 10 years ago. I say ‘inspired by’ because the song has nothing to do with Mary Winkler. It IS about a preacher’s wife. The line “late Wednesday night” is because church happens here in the South on Wednesday nights. I don’t know if it’s like that over in the UK or not, or even up north from here. But it was after church, he was on the phone with his lover, Caroline, and she overheard that he was going to kill her so that he and Caroline could be together. Can we talk about ‘stage fright’? You mentioned that it is the reason you don’t really play ‘live’. Has it always been there? And another said, “Yeah!? Nobody asked YOU to sit here.” And that’s it. That’s the single defining moment of where I can pinpoint my shyness beginning to develop. Because every year after that only got worse. I wasn’t pretty, nor confident, or brave. I became literally afraid of people. There were bullies that made it worse. Girls can be much worse than boys. But there were boys who were just as awful. And 3 girls in a grade higher than me really picked on me and my friends a lot. I don’t know why. We never did anything awful to them a day in our lives. I’ve never been in a physical fight though. For that I’m thankful. I’m a very peaceful person. A peacemaker. If not though, I’d have kicked some serious tail. I sure was angry enough. So how do you reach an audience? The internet is my audience. It’s how I connect. I first uploaded my music to mp3.com (before it was bought out by whatever company bought it out), and changed its format completely, took away the indie focus. By the time Mp3.com closed down I had more than 100,000 downloads and sold a bunch of CD’s. I made money. That was a big deal to me. A nobody folkie from Tennessee selling music to strangers on the internet…getting fan letters…contract offers. Those are the greatest compliments to me, because it’s the only reason I ever share my music. I hear that Jewel is a big fan of yours? Well, that’s a funny story. I was featured on Jewel’s website in 2002 as their first featured indie artist for a site she launched called Soul City Cafe. No longer in existence…sadly. It was cool. There was a contest for people to go on tour with her, and one day I got a call from Jewel’s people… it was surreal. I wasn’t allowed to enter the contest because of the fact that it was considered gambling, and gambling wasn’t allowed in Tennessee at the time. They said they felt horrible about me not being able to enter the contest, so they wanted to make me the first featured artist, as a sort of apology, because they said they really liked my voice and my songs a lot. You have to realize how big of a Jewel fan I was back then. I was on cloud nine. The college newspaper did a story on me. My picture was on the front page and I couldn’t believe it. After that, things just started happening. ‘Moon Hanging Low’ is one of my favourite songs, by anyone. I don’t usually ask, but what inspired it? Serena Matthews is one of the most talented and unusual singer-songwriters I have ever heard. I have no doubt that if she were to conquer her stage-fright and put a career before her family, she could be a major ‘star’. In commercial terms. That’s not how it is though. She is happy with life and I respect that. I listen to her music because I love it, respond emotionally to it and because it is so unerringly lo-fi. Does it matter that she doesn’t play ‘live’? No. I’m just happy to have found her. She is one of the reasons I adore the Internet. Find out more about Serena’s music here. Copyright © 2012 William Henry Prince, original post here.